We are currently updating this study. The 2nd edition will presumably be published in the first quarter of 2019. This market study of Ceresana offers a complete overview over the global market for catalysts. Catalysts are substances which increase the rapidity of chemical reactions without being consumed themselves. They are used in a wide array of applications: Catalysts are needed in the production of everyday goods such as packaging and cosmetics, but also for agricultural fertilizers or stationary. Catalysts for motorized vehicles are not examined in detail, since they only account for a very small share of total market volume. In addition to data on demand, this study also provides figures regarding revenues. This market study offers detailed analyses of demand for catalysts in the refining of crude oil, chemical synthesis and polymerization. Also, detailed information is given on revenues generated in individual applications. Since the global economic condition is brightening again, demand for catalysts rises. Private consumption is essential in this development. We forecast global catalyst revenues to rise to approx. US$22.4 billion until 2021. Even though the absolute volume sold rises as well, this rise is mainly due to an increase of prices. In 2013, North America was the largest consumer of catalysts, due to an extensive petrochemical sector. Accounting for a market share of 42%, North America consumed a higher amount than the high-growth region Asia-Pacific. Demand in Western Europe, however, is anticipated to fall: This region exhibits a trend towards renewable energy, in order to reduce the dependency on crude oil and for reasons of environmental protection. Moreover, the southern EU-countries in particular are still suffering notably from the effects of the euro-crisis. Environmental protection amendments adopted by the European Union are resulting in alternative energies becoming more important. Gasoline is, for example, mixed with vegetable oils. Fermentation processes are used to generate energy from biomass. As vegetable oils are not refined, no catalysts are needed in their processing. The USA are the by far largest consumer of catalysts. In this country, the amount of crude oil processed using catalysts is especially high. China ranked second; with an expected AAGR of 4.5% per year, this country is likely to experience the most dynamic development of all 20 countries included in this study. Development in Spain and Italy, on the other hand, will proceed highly differently: These countries, still affected by the euro crisis, are faced with the challenges of having to rebuild flagging industrial sectors and, first and foremost, offer jobs to young people in order to prevent an emigration of knowledge. About 80% of all catalysts consumed are utilized in the refining of crude oil. Various processes, e.g. fluid catalytic cracking, hydrocracking or reforming as well as others use catalysts. The highest growth rate of 3.1% p.a. until 2021 we forecast for polymerization. Major application in this subsegment is the synthesis of polyethylene (PE) and polypropylene (PP). 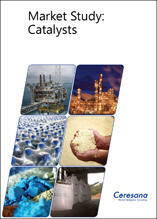 Catalysts are also used in the biobased production of polyethylene and polypropylene. The global market for bioplastics is expected to grow at an AAGR of almost 20% p.a. in the next eight years. Given the high amount of products with varying prices, a different pictures emerges when revenues are analyzed. Chemical synthesis and polymerization consume a much higher amount of metals or mixed metals as catalysts, which are more expensive than, for example, the zeolite used in fluid catalytic cracking. We forecast revenues generated with catalysts for chemical synthesis to increase to approx. US$8.7 billion during the next eight years, due to the upturn of global economic development. Catalysts can be found in various reactions of chemical synthesis. Important processes that consume catalysts are the production of ammonia, the nitric acid manufactured from it and methanol. In quantitative terms, the use of catalysts in vehicles and fuel cells, based on precious metals such as platinum, is negligible. Therefore, these catalysts are not covered in detail. Chapter 1 provides a presentation and analysis of the global market for catalysts - including forecasts up to 2021: For each region, demand and revenues will be explained. Chapter 2 offers a detailed analysis of demand for and revenues generated with catalysts in the refining of crude oil, chemical synthesis and polymerization split by 20 countries. Chapter 3 provides a substantiated analysis of individual applications of catalysts: Data on demand development, split by the seven world regions Western Europe, Eastern Europe, North America, South America, Asia-Pacific, the Middle East, and Africa are given. Chapter 4 provides profiles of the largest manufacturers, clearly arranged according to contact details, turnover, profit, product range, production sites, profile summary, products, and applications. Extensive profiles of 78 manufacturers are given, including Albemarle Corporation, Arkema SA, BASF SE, Bayer AG, Chemtura Corporation, China National Petroleum Corporation, Clariant International Ltd., Exxon Mobil Corporation, Haldor Topsøe A/S, Honeywell International Inc., Johnson Matthey Plc, Lanxess AG, Royal Dutch Shell Plc, Sinopec and W.R. Grace & Co.